Frank Lake, found 50 km southeast of Calgary near High River, Alberta, is a productive wetland important to hundreds of bird species. Once completely dry, this wetland has been saved from drainage and drought through a progressive partnership between industry, government and ourselves. It is now listed as one of 597 Important Bird Areas in Canada. We began working at Frank Lake in 1952 when a record run-off resulted in severe flooding; we constructed a drainage ditch that secured the main lake and its basins. In 1975, we partnered with Alberta Environment to build a steel weir on the south end of one of the basins to stabilize the lake. By the 1980s, sustained drought caused the lake to go dry despite these efforts. The answer to stabilizing Frank Lake came in 1988 when we joined forces with industry and municipal, provincial and federal governments to secure a long-term water supply for the lake. A pipeline was installed to divert water from the Highwood River, and a series of dikes and water control structures were added to restore the lake to its former water levels. 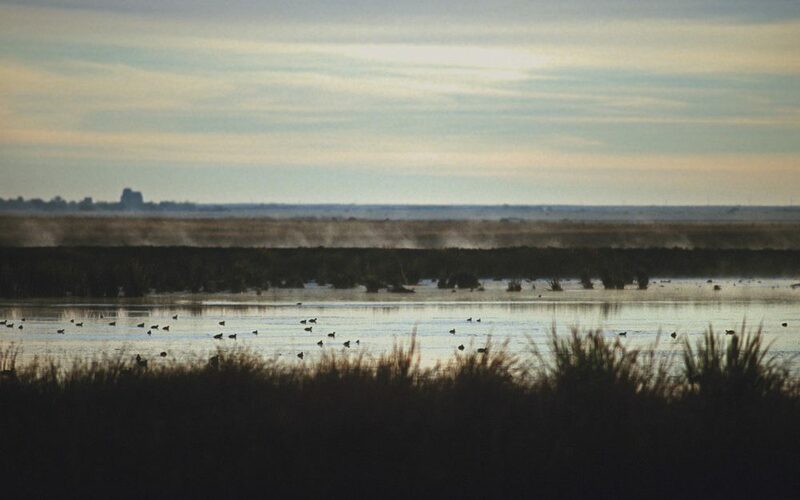 The wetland complex now encompasses three basins totaling nearly 3,100 acres of flooded area with an additional 1,700 acres of managed upland habitat. The uplands are both native and seeded grasslands that benefit wildlife and waterfowl nesting. To date, 190 plant species, 194 bird species and over 16 mammal species have been recorded at the lake, including many that are regionally or provincially rare in status. From the High River overpass on Highway 2, proceed east on Highway 23 for 5. 1 km. There is a turnoff on the south side of the road that will take you to the main access gate and parking lot. During open hours, vehicles can proceed through this gate and continue for 1.6 km to the viewing blind.